"Friday, March 30th. 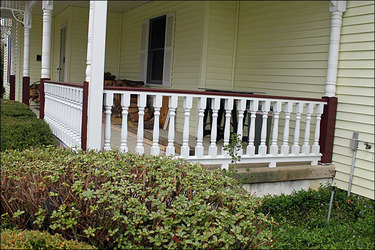 All of the painting has been completed in preparation of installing the new railings and balusters." "Saturday, March 31st. The first section of the new railings and balusters has been assembled and is ready to be installed. 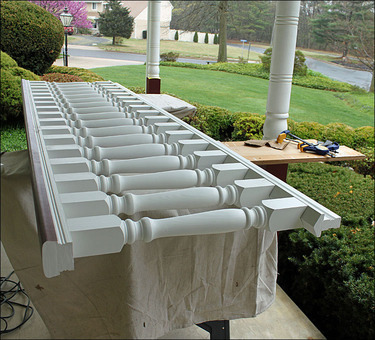 There is a bottom railing, the balusters, a sub-railing and a top railing for each section. It took approximately two hours to assemble each section." "Getting ready to install the first replacement section." "First two sections installed and looking great. We decided to add a little color to the 'next generation' of the porch so the bottom of the columns and the top of the railings are an auburn color." "Sunday, April 1st. 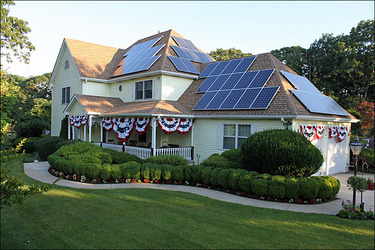 I'm not fooling around when I tell you that I was so happy to complete this project." 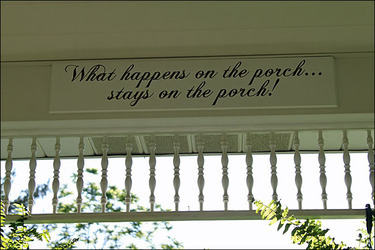 "I really believe it's the porch that makes it possible to express the 'old fashioned' type of patriotism. "I really did get a lot of assistance and guidance from the Vintage Woodworks representatives and that definitely helped to complete the project in a manner that actually exceeded my initial expectations. Bill Wilhelm - A Very Satisfied Customer!" Dear Bill, The Folks at Vintage certainly love what you've accomplished! It's customers like you that have truly made these past 34 years so enjoyable. Thanks for sharing! Do you seek the cool side of the pillow? I don't intentionally, but the thought reminds me of spending time in my dad’s office as a child. He kept one in the corner... I can only assume for my brother and me ... he certainly never took a nap at his desk! It was right under an air vent; cool, comforting, and now a cherished memory. But, nap time wasn’t the best time at the company offices. Growing up around Vintage Woodworks, I got to observe and help a lot! I cleaned bathrooms (not as fun now as when I was 7), organized the supply shelves, stuck labels on catalogs in the mailroom, and walked around the showroom like I was a sales person (yes, I thought I was very strategic to Vintage in those years!). It was all just for fun and a few quarters for the chores until I was twelve. That year I witnessed a veterinarian examining one of our pregnant cows. That made my decision easy… I would be a businesswoman instead of a vet! After high school I enrolled as the 5th consecutive generation in my family to attend TCU (Texas Christian University). I earned a business degree specifically to return to Vintage, hopefully able to be more strategic this time! Eleven years full-time at Vintage have flown by and has proven to be far more than just a job. I thoroughly enjoyed pulling together last month’s history of our first year, a time I do not remember personally, and I am proud Vintage Woodworks is well into its 2nd generation, with my brother and our cousins having all worked with us at some point! I am even more pleased to be able to carry on the values and service the previous generation established 34 years ago! 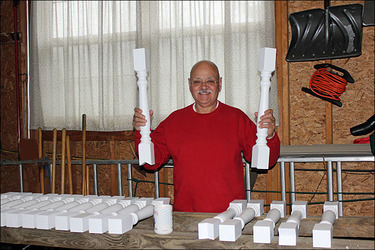 I treasure each day I work alongside my family and each customer we get to help, like Bill Wilhelm featured at the left. I hope each of your summer nights are as pleasant as my childhood evenings on the front porch of my family’s farmhouse. • Previous issues of our email newsletters are now on our website. Browse the Archives! • We have improved our "Shop by Size" chart for Brackets to make finding the perfect Brackets even easier! • Don't forget to shop our "Overstock Sale." Items on sale are noted at applicable product pages. She's been with Vintage for 28 years. As our office manager, she really does "keep it all together" for the rest of us! Rhonda says, "It's wonderful to be there with customers from the beginning to the end of their project. It is truly a pleasure to see the end results and know that we also made a friend along the way. "I have a wonderful memory of an elderly couple that visited our showroom in the mid '80s. I worked with them on multiple occasions on their cottage style home, and looked forward to their visits as they were so in love and so kind. "The last time I saw them, the lady asked if I had noticed the beautiful sky that day. I hadn't, and said I had been too busy. Her reply was, "Honey, make sure you always take time to smell the flowers." Now, 28 years later, I can honestly say yes, I do take time to smell the flowers... and, I know they are smelling the flowers right now as well!" "Want to thank you for being in business... Still enjoying the fretwork we bought a mere 23 years ago for a bathroom in a Victorian brownstone — and hope to do something similar for a future project. Wishing you the best." "Nice :) Congratulations on your 34th! I've told many about your great operation. Keep up your good work!" "This was great! Always like to hear success stories like this and your company is a pleasure to deal with. My house and front porch are filled with your millwork. Everyone always says "I didn't know anybody still made this stuff". Well, back in 1995, I didn't either - I was one of the ones who happened to see those small ads in Old House Journal magazine, called and got a catalog and 17 years and thousands of dollars later I am still enjoying your fine millwork. I'd be very interested in reading your history after the first year as well!" Thanks, guys & gals! We've said it before... we're quite positive that our customers are the finest anywhere! And, because so many of you asked, we will continue sharing our history in future newsletters, including next month. Stay tuned! Remember you can browse previous editions and read other newsletter feedback at our website. Don't forget to "Like" us on Facebook! After you do, please send us a Facebook message, and we'll reply with a Coupon Code for $10 off your next order.